FULL LINEUP OF "MAX-ED OUT"
available now for pre-order at Amazon.com! 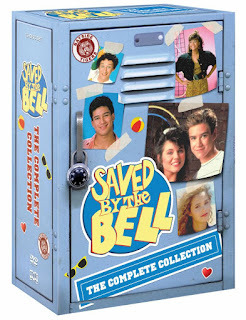 Saved by the Bell: The Complete Collection, a "Max-ed" out, completist's DVD set of the iconic and addictive '90s Saturday morning sitcom. Set in the fictional town of Palisades, California and in the hallways of Bayside High, the breezy adventures of Zack Morris (Mark-Paul Gosselaar) and his friends -- Kelly Kapowski (Tiffani-Amber Thiessen), A.C. Slater (Mario Lopez), Jessie Myrtle Spano (Elizabeth Berkley), Lisa Turtle (Lark Voorhies), and Samuel "Screech" Powers (Dustin Diamond) unspooled in hilarious fashion across 86 unforgettable episodes and home audiences can relive the laughter, lessons, and love all over again with this loaded set containing more than 46 incredible hours of Bayside bliss, including every episode from 1988's "Good Morning, Miss Bliss" which became "Saved By the Bell: The Junior High Years" and the fan-favorite "Saved by the Bell" to "Saved By the Bell: The College Years" and the two feature-length TV movies that followed. I grew up watching Saved By The Bell and could still remember almost every episode when we binge watched this set. It is great to remember the good old days and good old times if you are an 80s baby. This series was so cool when I was in high school and is still a fun watch now! I want to win this for my wife, Kelly. "Who would you want to win this prize for and why?" I want to win this for myself because I have only seen mere crumbs of this show and my "Saved By the Bell" education is incomplete! For myself. Loved Saved by The Bell, and I’m a nostalgia freak.